On the PS4 it is a shoulder button. I have not tried on PC. In any event, there is a way to see the cards description. This screen also shows base power and provision cost. Thankfully, no guesswork or memory required. I do agree though, memory should not be a requirement. You may be right....I'm not near my PC at the moment; I remember one can definitely see the description....just couldn't remember if the provision cost was there, too! Also Formation is a more versatile Zeal and we all know how good Zeal is. Yeah, just that we already have a keyword for Zeal, it's called "Zeal"
Yes, only that this can allow you to get more points in case you do not need it. What I stated is that Formation is something like a Zeal+. I already expected a neutral card that gives a shield and old palisade seems a perfect fit for it. Propably we will also get a neutral card for purifying. Sirssa has a really great design and seems to build a good bridge between the expansion and the base cards. Though I'm not sure, if her provisions might not be a bit too high. Primal Savagery seems a bit weird, as it has a really specific condition and it feels like that card can brick easily or just disrupt the play. By the way, I really like how the expansion and the new keywords make the game less hard removal heavy. Shields protect engines, Bleed is pretty much the opposite of hard removal, Deathblow often can't be a chooser and to get max value you often haven't much choice what you want to damge, and even Poison gives the opponent at least 1 turn compared to cards that instantly kill engines. Aaaand we have 3 more cards today! Great Oak looks great and seems to greatly support the ST swarm archetype. But why is the Great Oak only a Bronze card? Fleder looks like a cheaper, but weaker version of a Griffin. I'm not sure yet, that it will see play. Devil's Puffball looks good for ST, but will there be other faction cards that can also interact with Poison? Else that card will be pretty much useless outside of ST. Bomb deck looking more and more doable. It is gold. Check the top left corner. The symbol doesn'T say that it is gold, only legendary, which in theory should be independent of wether a card is bronze or gold. And in the list of all revealed cards, Great Oak is listed as a bronze card. It's the same with Sirrsa, which is a bronze, too, but epic. Or the Card Reveal list is incorrect. I believe that all borders are generic in the reveals. Would give more attention to symbol in the corner... just check the previously revealed cards. Does death by poison trigger deathblow? So Great Oak is an objectively better version of Old Speartip, having removal potential, being able to distribute points, dodging Professional and being able to deny engines, all while being 2 provisions cheaper than Old Speartip. Honestly if the Old Speartip nerf is still deserved this card is broken. Being cheaper than the 3 comparable cards Commanders Horn, Old Speartip and Zoltan. Right, first they nerf Golden Froth and then re-introduce it under a different name. Honestly if the Old Speartip nerf is still deserved this card is game breakingly good. I do not argue, it is good card, but would not say that objectively better than Old Speartip. I am not saying it should not exist, what I am saying is that it only requires 4 units in a row to reach the same value as Speartip, while being able to move points to damage (to dodge removal and disable engines) and being 2 points cheaper. Saying it is an 8 point card is not exactly easy to be the case, it is extremely uncommon to have less than 2 units on a row, unless you are doing something wrong. What I am saying that this is an Old Speartip on crack as a finisher and can more easily swing a round in your favor, while being a lower provision investment. And against a Green deck it will easily still be good as a large body. Not to mention that against Blue this will rather likely be used to cement a (-1) for the last round, being a large point gap to overcome, while denying 1 engine. This is definitely an all around stronger version of Old Speartip, which in an on itself allows to tempo an opponent down a card, a concept terribly neglected by Scoiatael in homecoming, this should fix that. The power of the bomb depends on whether it counts "killed by poison" as a trigger for its deathblow. So it is either slightly conditional or mass removal. While it might be objectively better, looking only at the card itself, Old Speartip offers extra value by being consumed, giving Thrive and being the highest unit on the board, such that it adds quite some synergie. 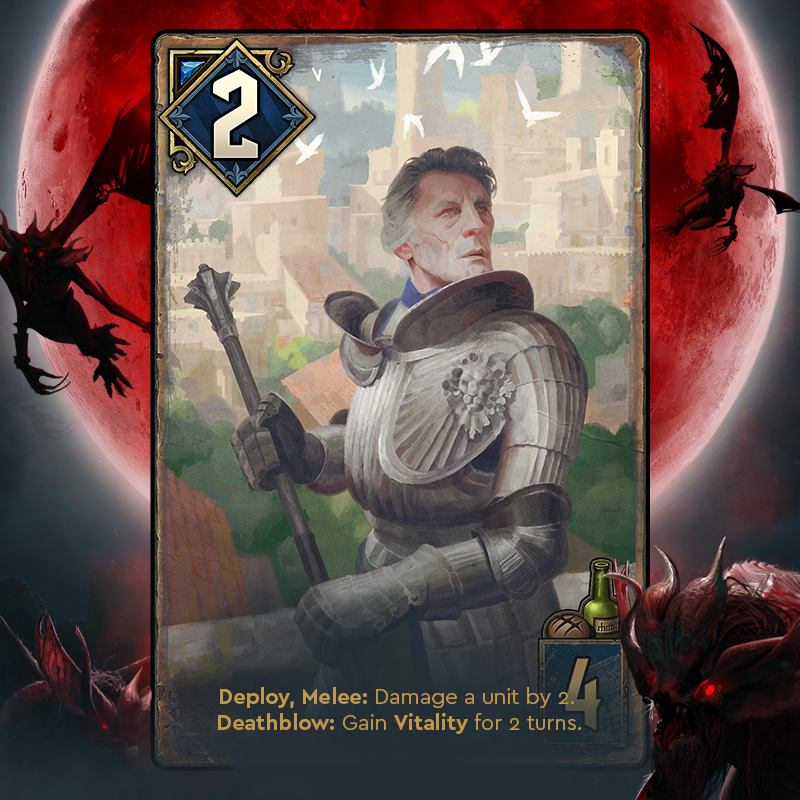 Furthermore, Zoltan and Commanders Horn are neutral cards, such that it is alright to have a stronger faction specific version of those. And because this card is faction specific, it has a completly different environment than those cards that work for every faction. You missunderstood me in case you assume I said it would be too strong, what I said is that it is individually, so without taking the specific environment into consideration, stronger than Old Speartip. This is a card ST should have, given that they lack a finisher prior to the expansion and lack the ability to invest a larger amount of provisions into one large play to tempo and that majorly limits design on ST decks (in the deckbuilder) and their respective playstyles. 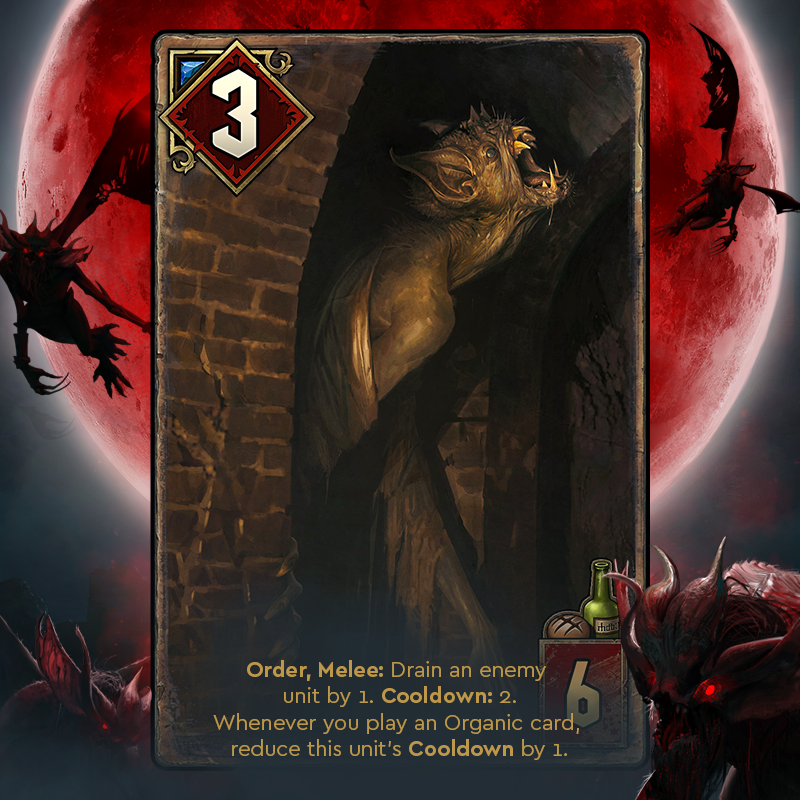 What are the chances of Draw & Mulligan changes in Crimson Curse? I know you've stated on a Dev stream that you want to change things slowly. I'm enjoying the reveals, and loving the pace of engagement you're giving the community. You've made much better efforts with engagement since the Homecoming backlash. I'm hoping the additional cards makes this game as interesting as pre-homecoming and deck building becomes a lot more interesting beyond the initial expansion rush. Those 3 new cards are definitely interesting, the first on its own will propably be almost unplayable, given the massive amounts of removal people run and a 3 point body being extremely low. However with Organics (which there is no other incentive to run in masses thus far) it can reach 2 points per turn, which is regular Gernichora Slyzard value (which has 1 more point to remove, 1 less provision and blocks the Fruits from being used elsewhere) and can be protected with Avalach and Eredin to actually enable a functioning deck. least one that actually tries not to lose), outside of certain matchups and does only offer high roll value. Currently it is about as interesting as the movement package ST has. 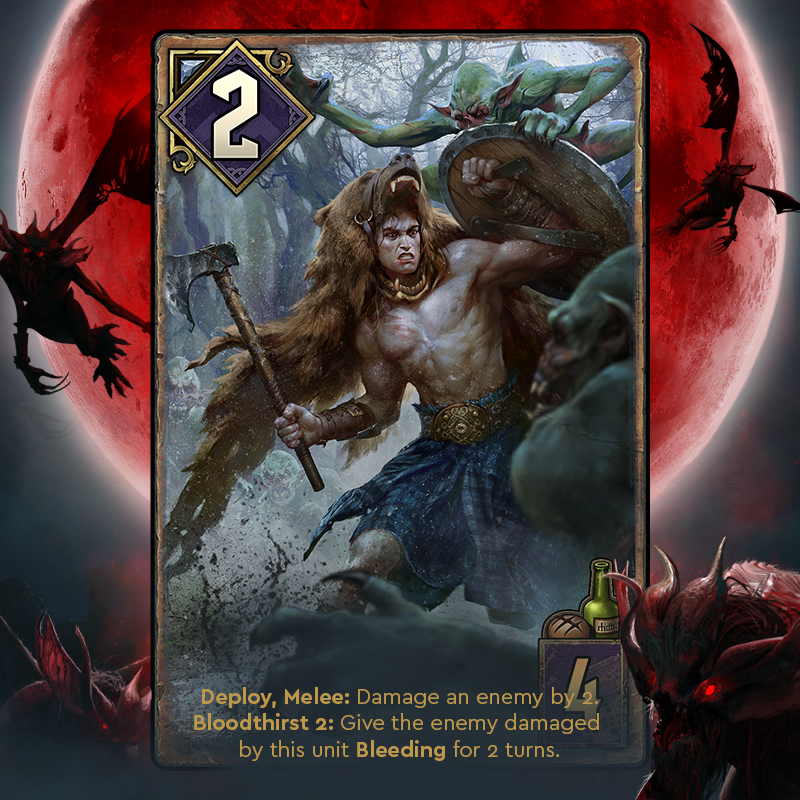 The SK 4 provision card seems really good, being a Wold Pack with potentially 2 more points, 1 ticking right away and holding synergies with Crach to enable at least Bloodthirst 1 for having a target with more than 1 point. The NR 4 provision card also seems decent, punishing 2 or lower units by offering an immediate 5 point card (4 in case of a 1 as a target) and an additional boost during the next turn. The NR and SK cards are definitely improving the low provision pool of their respective factions, especially for NR.